Avatar are to launch a new weekly webcomic in October, based on Garth Ennis and Jacen Burrows’ Crossed. 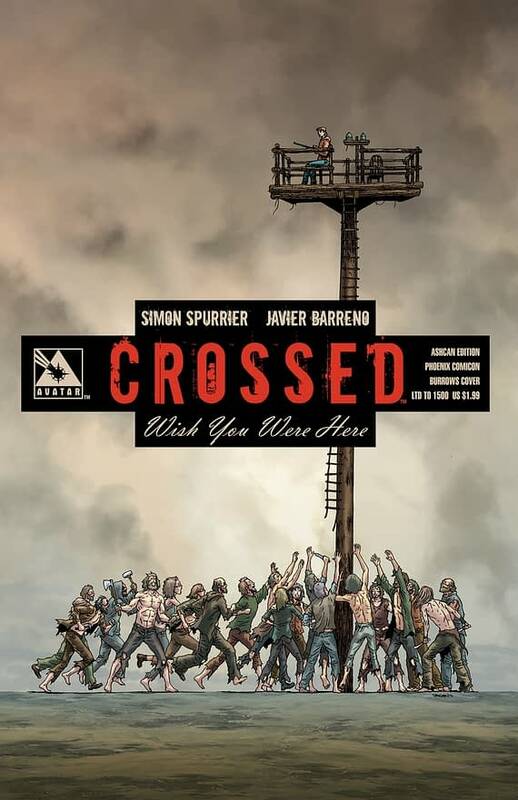 Crossed: Wish You Were Here by Si Spurrier (Gutsville, X-Men) and Javier Barreno (Crossed Family Values) will be announced at Phoenix Comic Con and the new website hosting the free weekly Crossed episodes will be at www.crossedcomic.com. The site will also cover Crossed in print, online and in the movies, with commentary from notable types. Crossed: Wish You Were Here will follow the Freakangels format, serialised online, collected in trade paperbacks and translated around the world. The webcomic will be free weekly episodes that are later collected in print volumes, similar to the FreakAngels model. An ashcan for the series will be available at Phoenix Comic Con from the Avatar booth (201-302) with Si Spurrier on hand to sign.